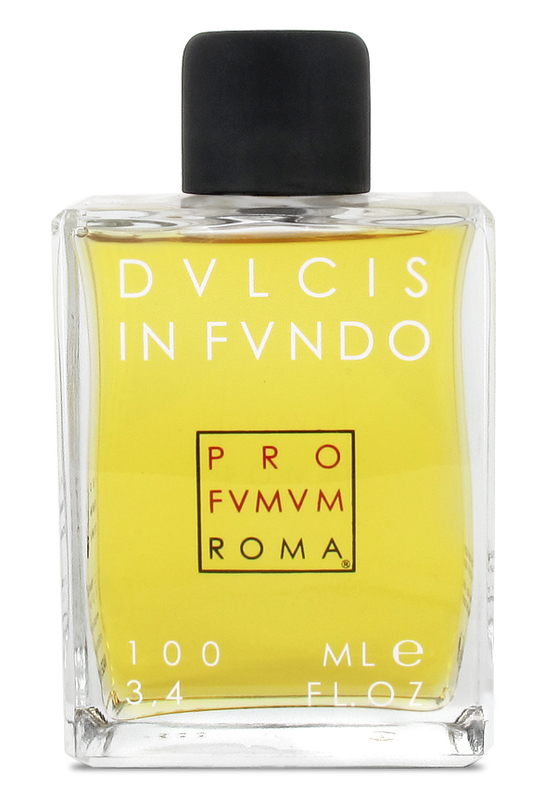 Dulcis in Fundo is a shared / unisex perfume by Profumum. There are 11 reviews of Dulcis in Fundo. Another impressive entry from the house of Profumuma Roma, Dulcis in Fundo embarks us on a fragrant journey with two familiar tools, vanilla and fruit, used in a precisely-nuanced way to show us something different and exciting while similarly reminding me, at least, of both Meringa and Acqua e Zucchero a little bit each. Dulcis in Fundo brings a boozy vanilla together with what seems to be a mix of citruses, but primarily orange, perhaps paired with orange blossom. Unlike Meringa, though, it's not a creamy meringue-esque type of combination. Rather, the citrus component in DIF does has some tartness to it, so as one reviewer suggests, it might involve bergamot. Still, the relationship between the vanilla and citrus is very harmonious. It might lean slightly toward vanilla, particularly in the dry down, but the force of either is on par with the other. Performance is, as has come to be the standard of the line, exceptional. A very strong projector but unusually long-lasting, Dulcis in Fundo requires only a couple of sprays to yield a comfortable scent cloud. I find that DIF might work better as a cold weather option, contra Acqua e Zucchero being more apropos for warm weather, at least in my opinion. DIF is similarly to both AEZ and Meringa but is special in its own right, and I'll probably be inclined to buy a bottle in the next year or so. The opening, as the name goes, is much "dulcis" and not even that "in fundo". As the notes listed read, it's mostly all about vanilla and citrus, although this is what I personally smell: vanilla for sure, caramelised resins on the base, sandalwood, perhaps ylang and perhaps ginger too, and a citrus accord on the "aromatic-orange" side (bergamot, citrus and neroli? ), so quite sweet, aromatic and silky. Fizzy and sweet at the same time. A bit sticky too, to be honest, but with both some pleasant shades and a zesty breeze that cleverly counter-balance the overall sweetness - which is however the prominent accord: a warm, caramelised gigantic sweet floating among bergamot leaves and citrus drops. Better than many other gourmands in my opinion, as it's at the same time simpler, less "cloying", less boring too, with a pleasant fresh breeze that makes it lively and nice to wear even after a while (and even if it's quite a linear scent). Nothing stunning, and with a predictably plain and synthetic drydown which makes it even less worth the crazy price... but nice enough if you get it as a gift. I tried this as I'm a vanilla lover... it smells very literally of a delicious, rich orange creamsicle pop. Very foody. The vanilla can't really be picked out on its own but melds with the orange to create the creamsicle effect, which is quite linear for a good while. Then deep into the drydown, when on its last legs before petering out, it takes a turn toward the very sweet. Smells high quality and like it's made from top-notch and expensive ingredients - I love smelling it as it is mouthwatering, but I do not have a strong desire to walk around smelling this literally of an orange creamsicle pop. Which is somewhat of a relief, as it's $240 a bottle. Lovers of gourmands may want to give this a try though. Givenchy's Organza Indecence is also an orange-vanilla composition, but not as foody as this. Cons: Do you really want to smell this literally of orange creamsicle?" I thought it might be a gourmand I could like, but this is too foody for me. The fun Orange Creamsicle note is nice, easy-going and childhood-inducing. But I like a little more 'skin' and 'body' in my gourmands. If you're looking for comfort food in your fragrance, this will be a delight. I first smelled this at the very start of my perfume journey, and of course, gave it a 5. When a perfume smells so good you want to drink it and dive into a pool of it, that is a 5 rating. I just rerated this fragrance to a 4, but really, I still feel the same. There is not complexity here, there is only the juicy orange that segways into a creamy vanilla that then transitions into a true semi-sweet vanilla. Not high art, but I continue to feel how well this accomplishes it's very simple goal. For a citrus semi-gourmand, you would be hard pressed to find a better representative. This is the orange of a fresh picked fruit. There is nothing synthetic feeling or smelling to me. The vanilla is creamy then austere, again uncomplicated, but true to it's purpose. It retains a slight orange feel all the way until the final drydown, mixing and mingling. Happy and carefree. And that is exactly what this fragrance does - smell good in a happy and carefree way. There is a place for this, I've no doubt. There are no member images of Dulcis in Fundo yet. Why not be the first?